Traveling as a couple allows you to learn new things about your partner in unique circumstances. It's imperative to get to know your partner before committing to each other for the rest of your lives, and traveling for days at a time to escape the city noise is a great way to rediscover each other and to strengthen your relationship. But before you decide to travel around the world, why not try and discover these amazing spots that are within your reach. Whether that's reading a book or simply enjoying the scenery, this is the best place to spend some quality time with each other in peace and solitary. Unleash your adventurous side with a 4x4 ride through the Sand Dunes of Paoay. Before you get hitched, do something big and daring like conquering your fear of heights! Considered one of the most beautiful waterfalls in the Philippines, this place is definitely a must-see destination. Lush greeneries plus clear, blue waters—what more can you ask for, right? 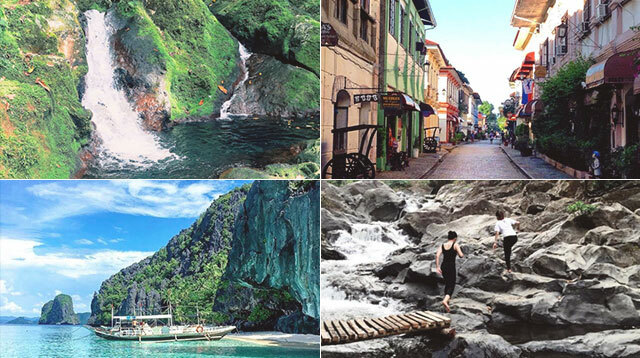 With brick roads and colonial infrastructure everywhere, it's the best place to indulge in classic Filipino culture. While some beaches can be crowded and noisy, Sambawan Island gives you the tranquilty you need for your much-deserved R & R.
If you want time alone but don't want to go too far, you should try going to Nasugbu, Batangas. It only takes a few hours to get there and you get to experience walking paths like this! Experience the beauty of Mother Nature with this small island you can call paradise. Aside from the amazing view, there's a lot to do in Sabang. You can try rock climbing in Ugong or you could take a dip in Sabang Falls. One of the untouched gems of the Philippines, Bulalacao Island in Mindoro will surely take your breath away. Don't be afraid to take a dip in this majestic river - it's refreshing and calming all at the same time. Another white sand beach that's not too crowded. It'll be the ideal place to contemplate and relax before heading back to the city. Although it's not really a "destination," the solid, rocky formations alongside the road are enough to leave you in awe and admiration. If you're looking for a place to unwind, without having to spend too much, Nagcarlan is the way to go. Don't forget to take a tour of the old churches, or if you're feeling a bit adventurous - go hiking!